The Biebrza Valley is protected as the special protection area “Ostoja Biebrzańska” and the special area of conservation “Dolina Biebrzy”. The Biebrza National Park is found here. The Biebrza Valley is known not only in Poland but also in the whole Europe as a place where numerous bird species can be watched. One of the most important species is the Aquatic Warbler, a small, brown-gold bird that attracts bird-loving tourists from across Europe. Globally, the Aquatic Warbler is threatened but the Biebrza Valley is home to a relatively large population. While protecting this species, OTOP observed that in the Biebrza Valley, the Aquatic Warbler breeds also outside of the National Park. Breeding sites are found in the drained sections of the marshes used as meadows. The Aquatic Warbler could still breed there while the meadows were farmed. However, today many of them have been abandoned and are slowly getting overgrown by reeds and bushes. This is why OTOP identifies the owners of the abandoned parcels and purchases them to introduce management that promotes the Aquatic Warbler. This is how three new community reserves originated. The Mścichy Reserve comprises about 435 ha of fen mire area west of the Biebrza National Park, between the border of the park and the Mścichy village. The area is dominated by communities with the Narrow Small-reed and small sedge flush, which are mown once per year, or twice per year in dry years. The south-eastern part of the Reserve borders with forest, and the prevailing habitat is reed beds and the Purple Small-reed. In spring, it is flooded by melting snow and rain, and water from the Biebrza river. Despite drainage, up to 2-metre deep peat layer is still present. In the past, the area was used as hay meadows by farmers from Mścichy, with the northern part of the Reserve used for peat excavation. Nowadays, only the parcels adjacent to the causeway and village buildings are mown. This has caused changes in the structure of the sedge fen that are unfavourable for the Aquatic Warbler (such as excessive growth of tussocks as well as Reed Sweet-grass and Reed Canary Grass swards). This site hosts the largest population of the Aquatic Warbler in the buffer zone of the Biebrza National Park, which is not protected by law. In 2007, there were about 65 singing males (2.5% of the Polish population). In 2011, a record number of Aquatic Warblers was recorded in Mścichy, 127! They nest on the patches that were under mowing management until recently but they avoid those that have been completely abandoned. Conservation activities are therefore indispensable to maintain the existing sites and enlarge the area of habitat suitable for the species. Apart from the Aquatic Warbler, in Mścichy you will see breeding Garganeys, Corncrakes, Snipes, White-winged Terns, Spotted Crakes and Bluethroats. Laskowiec-Zajki consists of about 745 ha of fen between the southern border of the Biebrza National Park and the road connecting the villages Laskowiec and Zajki. Its western and northern parts are dominated by communities with the Tufted Sedge, which however do not form the characteristic tufts there. The eastern part is covered mainly by the Lesser Pond-sedge and the Reed Canary-grass, with addition of vegetation that is typical of wet meadows. The highest parts of the area are meadows mown several times a year. Thanks to the heterogeneous habitat, this area is characterised by especially high biodiversity. The Laskowiec-Zajki location is known among birders as one of the most scenic and attractive bird-watching sites. It is very important for migrating waders. In the breeding season, in Laskowiec-Zajki you can see the Aquatic Warbler, the Corncrake, the Great Snipe, the Snipe, the White-tailed Godwit, the Redshank and the Garganey. For many bird species, the area is also attractive as a stopover site. In wet years, you will see numerous White-winged Terns. You will also spot elks. 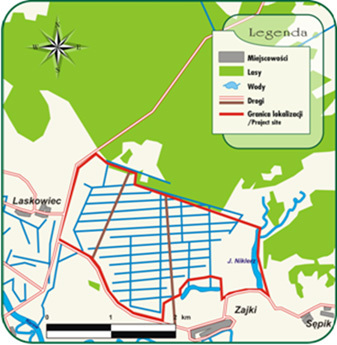 The Ławki-Szorce mire consists of about 76 ha of fen mainly covered by reeds and early successional stage forest. 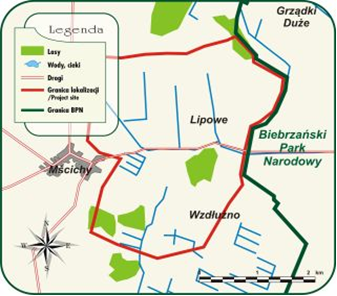 It is a marginal section of the vast Ławki Mire, located outside of the Biebrza National Park and separated from the mire by a road (the “Tsar Road”), which runs on a causeway. The Ławki-Szorce mire cannot be entered. Nevertheless, everyone who visits the Biebrza Valley should come there. The other side of the Tsar Road offers the best location in the world to watch the Aquatic Warbler – a wooden boardwalk on the Ławki Mire. The boardwalk Długa Luka takes you to the marsh habitat without getting your shoes wet, and – most importantly – without destroying the soft peat layer. The boardwalk is about 400-metre long and ends with a platform, where you can view the spectacular and vast Ławki Mire. Of course – the Aquatic Warbler! Also the Crane, the Snipe and the Bluethroat nest there. Elks and beavers are common, too.